I’m nearing the finish line in my Master’s degree in Leadership through Northeastern University. It’s been one hell of journey over the past five or six years and I’m proud of what I’ve accomplished. To say that upgrading and self-improvement was the only motivating factor would be a lie. After reading Chris Herren’s memoir, “Basketball Junkie” I knew I could do more. His story is one of devastation and redemption. From having it all at such a young age to nearly throwing it all away, it made me realize that if he could make it through that, I can push myself to higher limits. I’ve been fortunate enough to speak with Herren multiple times over the course of the past few years and every single time I am more inspired than I was before. Below is the first interview with him from back in 2012. Coming from a small town (Niagara-on-the-Lake, 15,000) I had the assistance of my family and a select group of coaches to assist me in attaining a scholarship to York College in Nebraska. Now with the viewership of my website increasing each month, I have had the opportunity to speak to some parents and give them my recommendation on where they could possibly send their kids to school and how to prepare for life after baseball. It’s just not getting that scholarship to play baseball, basketball or football. It’s a chance to get an education. 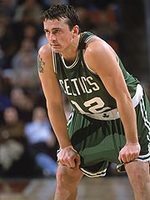 For those unfamiliar with the life of Chris Herren, he was one of the most highly recruited guards coming out of Durfee High School in Fall River, Massachusetts. 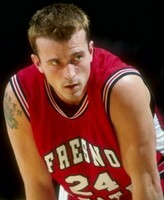 Herren attended Boston College and Fresno State University on his way to being selected in the second round of the 1999 NBA Draft (33rd overall). Quite possibly the best player ever to come out of Fall River, gracing the cover of Sports Illustrated and talked about in ESPN and Rolling Stone magazine, Herren should’ve been on top of the world. Regarded as second to Allen Iverson in his ability to run the court, he, unbeknownst to people around him, was battling demons that followed him for over 15 years. Those struggles are highly documented in his 2011 memoir “Basketball Junkie” written with Bill Reynolds and then on ESPN’s 30 for 30 documentary “Unguarded”. Herren has the innate ability to get through to people as evidenced by the success of his book, documentary, speaking engagements, and have them see the right in their ways. 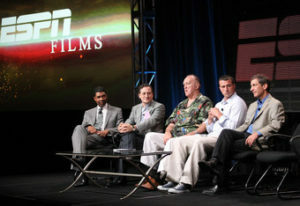 Chris Herren: I think it’s hard, but what I try to instil in kids in my gym is that basketball will end and you have to be prepared for that ending. I think the more fun the sports are for the kids they will continue it till the end. I see kids, they are 18-years-old and they’re done with high school basketball, and they never want to play basketball again because it wasn’t fun for them. And it’s the same for the college kids. If it’s a good experience for them, they will continue on with it. DT: What about the pressure that’s on kids these days even before high school starts? It has been seen that recruiting in basketball and football starts in middle school. How can these kids even possibly grow up in a normal environment when scouts are infiltrating their courts at such a young age? It’s a warped sense of reality isn’t it? CH: It’s sad. I feel bad for kids today because of instant media. Kids play in one tournament and they’re being judged five minutes later on the Internet. Unfortunately, kids are growing up with a lot of expectations. When I was in high school we had three or four writers who came out with a monthly report. Now, they’re playing and their game is all over the Internet within minutes. I find that to be very disturbing that kids are 14-years-old and being told they’re slow of foot and that they really struggle at certain areas of the game. There are hundred and hundreds of games left and kids are getting critiqued very early on in life and I don’t really like that. DT: Your own personal struggles have been noted in your book and the ESPN 30 for 30 documentary, but how did the idea of writing a book come about? Did you have any inhibitions about the project and letting the whole world into your past? CH: I’d be lying if I said I didn’t have any reservations. It made it easier for me to do this because the guy who wrote Fall River Dreams is a good friend of mine and he wrote that book on me in high school. We sat down and he was very well aware of the story, which made it easier to tell it to him. The purpose of this book was to hopefully get somebody out of a dark place. If I was able to do that the book was going to be a success for me. It had nothing to with selling books and it had nothing to do with making money-you really don’t make money doing it. It was more about reaching out to: the recovering, the suffering, the families suffering-that was the purpose of doing the book. My wife and I had many sleepless nights saying “should we put this in, should we put that in”. At the end of the day we didn’t take anything out because we thought, I didn’t want to miss anything. I didn’t want someone reading the book saying “well I’m doing this, and he never did that, so he can’t understand”. I put in everything I really went through to hopefully reach as many people as possible. DT: Your journey that started many years ago has turned you into a hero to some and an inspiration to others. Would you have ever thought that you would have ended up where you are today? CH: Never. I thought honestly that I would end up dead or in prison. That’s how I was looking at it. I am extremely blessed beyond belief. I tell people all the time, if you were to tell me to write my goals: in a year sober, I would have sold myself short. At two years sober I would have sold myself short. It’s amazing how my life has turned over the last three-and-a-half-years. DT: And seeing where you are today-helping kids turn their dream into reality-if you could go back, would you have not played basketball? Or do you think, because of what you went through, that this was what was supposed to happen? CH: I’m comfortable with how it played out. I’m not comfortable with the people I hurt along the way. My kids had to suffer at times, my wife suffered, and I’m not good with that. I’m good with everything that happened to me, I’ve found my peace. I worry about my loved ones who had to suffer along the way as well. DT: We’ve seen some very prominent athletes stumble, and of course it’s plastered across every media outlet. How can these athletes deal with the pressure when the limelight is focused on them 24/7, and the pressure of living up to expectations finally gets to them? Especially the ones dealing with very open and public battles. CH: I think the spotlight can work in both ways. If you don’t cherish and relish the spotlight and don’t stay in your recovery, the spotlight is fine. If you walk away from recovery and start saying that you’re normal, that’s when it’s dangerous. DT: In “Unguarded” you make a very powerful statement at the beginning where you said, “I had an opportunity, sitting in that gymnasium, to listen to that 35-year-old man who made mistakes.” What advice can you give to those athletes starting out that are feeling the pressure, or the burden to perform, but have no outlet or anywhere to turn? CH: I would suggest for them to walk away from it. I tell kids all the time, “be a professional at being yourself before you dream of being a professional at anything else.” If you don’t master yourself, you’ll climb that mountain and reach your dream and you’ll get smacked off of it like I did for not doing it the right way. DT: Things have obviously come full circle; the basketball player has now turned into Coach/Instructor/Role Model/Inspirational Leader. Can you expand on the details of your instructional basketball school? CH: We incorporate both. It’s more about teaching. The levels range from middle school up to guys playing in the pro’s and over in Europe. It’s more about building kids’ self-esteem, self-confidence, and enjoying the game. If you don’t have that, you don’t have a game. That gets lost sometimes in jump shots and athletic ability. There’s a reason why over 60% of all retired NBA players are broke after five years. It’s unfortunate, it’s sad, it’s tragic, but there’s a reason for it. Kids are not prepared to be themselves, they’re more like machines. And when the machine ends you have to deal with yourself. DT: Regarding your speaking engagements, how would someone contact you to speak at their rally/organization/school/business? DT: And what type of companies/organizations do you usually speak to? Do you have any preference? Is there a trend on your tour dates? CH: I do it all. I speak at a lot of high schools, a lot of prep schools, a lot of colleges, and I’ve also done some corporate engagements. Basically it’s whoever wants to bring the message into their area. I think it applies to every aspect of life. It’s not one group or another. Some people say the high school teams need to hear it more than others, I’ve spoken at colleges where the professors have come up to me and said “I need help, how can I get some?” You have to know who you’re talking to and who needs to hear it. DT: Finally, do you have any final words or comments to those that are truly inspired by your story? CH: When I did this I wasn’t sure. My intentions were in the right place to give back and to help. I had no idea what I was going to receive. But the emails and the messages of people who say thank you and who’ve been in dark places have given me so much in my life. We’re all in this together and we all struggle in different areas of life. It’s all about extending a hand and helping one another.